Cedarville’s Colby Cross (23) backtracks after a loose ball, in front of a festive Cedarville student section, Friday Dec. 22 in the first half of an Ohio Heritage Conference game with Greeneview. Cross led Cedarville with 23 points scored in a loss to the Rams. Senior forward Mason Schneider shoots over C.J. Pahl during Friday’s Dec. 22 boys high school basketball game at Cedarville High School. 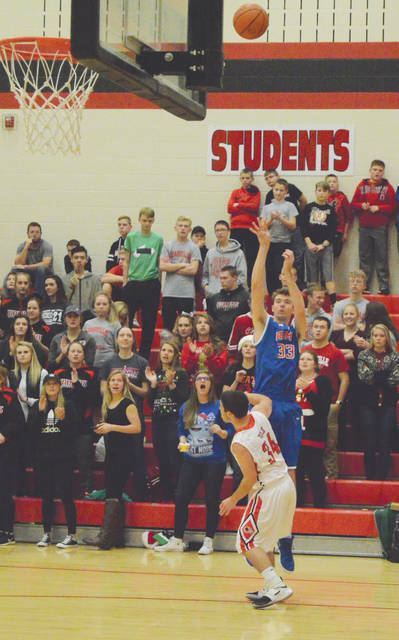 Schneider scored a game-high 27 points and hauled in 14 rebounds in Greeneview’s 64-50 win in Cedarville. Cedarville’s Jate Bradley (2) shoots over Greeneview’s Nick Clevenger in the second quarter of an Ohio Heritage Conference boys high school basketball game Dec. 22 at Cedarville High. CEDARVILLE — To say someone is ‘head and shoulders about the rest’ is a compliment for one’s abilities when compared to others. On Friday, in a Dec. 22 Ohio Heritage Conference battle with host Cedarville, Greeneview’s Mason Schneider was physically head and shoulders above the rest, in the Rams’64-50 win at Cedarville High School. The game roster didn’t mention’s Schneider’s height, but a recruiting website has him listed at 6-foot-7. Against a Cedarville team whose tallest player is 5-11, Schneider became a dominant presence inside. And that was right where Rams coach Kyle Fulk wanted him. Schneider finished with a game-best 27 points and 14 rebounds. Indians coach Ryan Godlove said Schneider is a tough matchup for his athletic but shorter team. Unofficially, Schneider had four blocks. Junior forward Nick Clevenger finished with 16 points for the Rams (3-4. 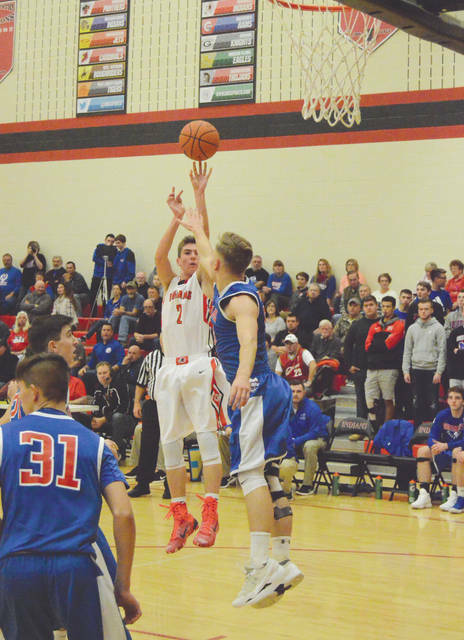 3-2 OHC), Jack Nix scored a trio of treys for nine points and Gabe Caudill scored eight, while Cam Treadway and Collin Wilson scored two each in the Rams win. 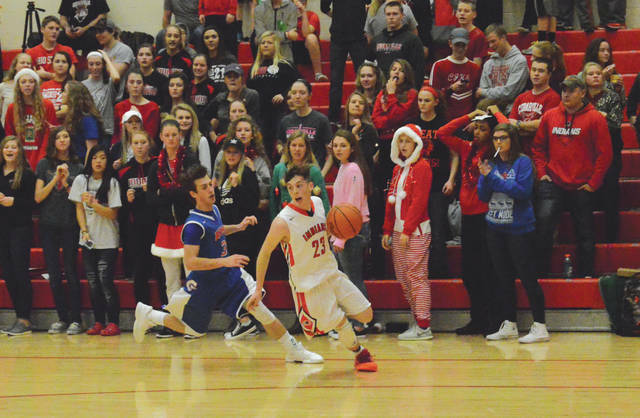 Fulk said he was well aware that Cedarville’s top scorer was Colby Cross, and so he sent out several different Ram defenders with the task of making it tough for the Indians sophomore to get a clean shot. Greeneview contested pretty much anything that came Cross’s way, and he still finished with 23 points. Cedarville’s Trent Koning scored nine points, Brandon Pollock tossed in seven, Jate Bradley and Ben Tarwater each scored four points and C.J. Pahl scored three in the loss. Cedarville is now 1-6 overall, 1-4 in the conference. The Indians take to the road for their next contest, a Friday, Dec. 29 matchup at Fairbanks. Greeneview has a game a day earlier. The Rams will participate in the Thursday, Dec. 28 opening round of the McDonald’s Holiday Tournament in Washington Court House, at Miami Trace High School where they will take on London.